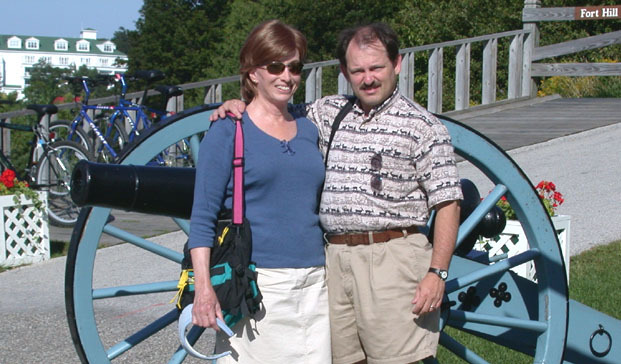 On Thursday, August 15th, we began the day touring Fort Mackinac and taking lots of photos there. 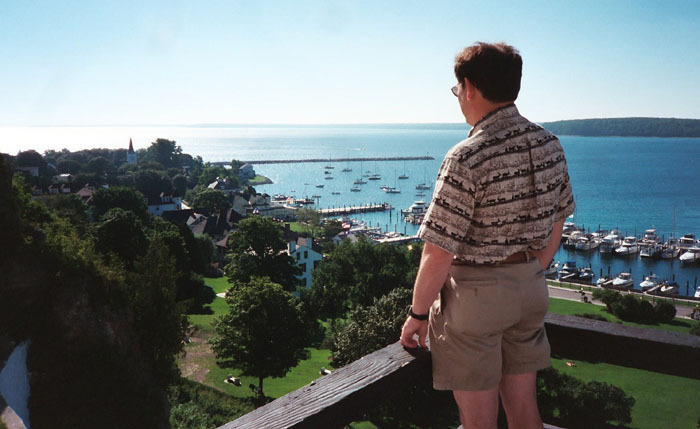 The rich history of the Mackinac area dates from the booming French fur-trade of the 17th century, with the British taking control of the area during the French and Indian War in late 1760. 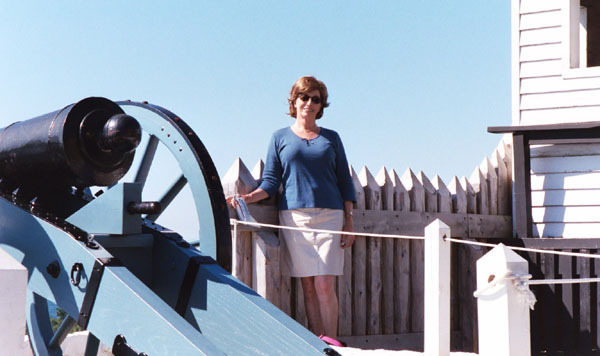 During the American Revolution, the British built the existing Fort on a commanding rise to defend and control the strategic Straits of Mackinac. The Americans assumed control of the area after the successful revolution. Except for a brief period during the War of 1812 when the British captured the Fort, the Americans have controlled the area ever since. 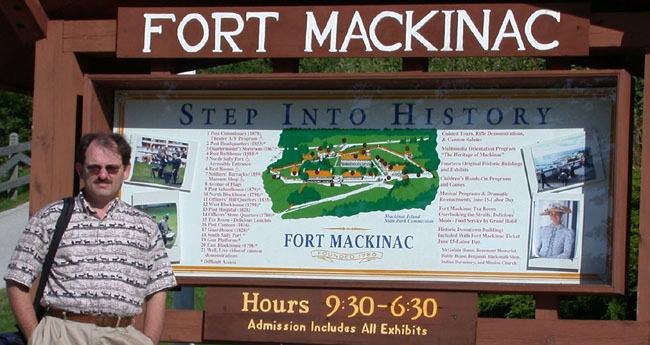 The Fort remained an active military outpost of the U.S Army until 1894, and became Michigan's first state park in 1895. There are many interesting buildings and exhibits to look at at the Fort (see the information in the entrance display photo below), along with cannon firings once each hour and demonstrations by "soldiers" firing their rifles on the parade-grounds in front of the barracks. It's worth taking a couple of hours to explore all the exhibits there. 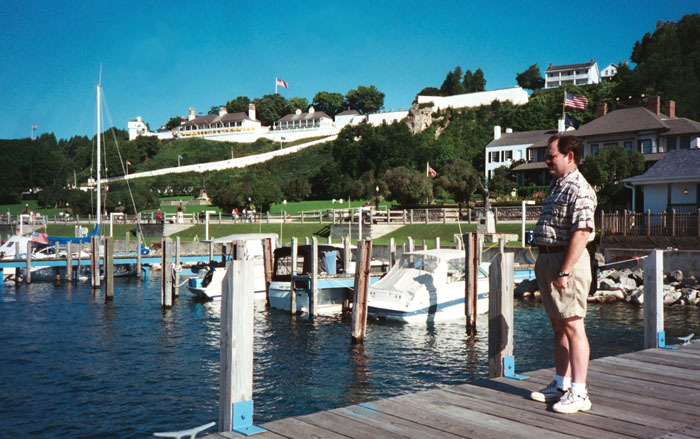 If you get thirsty or hungry, you can get refreshments, drinks and nice lunches at the Fort Mackinac Tea Room and eat outdoors under umbrellas at tables on its large veranda. The Tea Room's veranda has a spectacular view of the downtown and harbor (you can locate the veranda in the detailed view of the next photo by finding the yellow umbrellas). The Tea Room's excellent food is prepared by the Grand Hotel. We had entered the Fort using the slanting walkway that goes up the hill on its south side.We left through the entrance on its north side, which leads to a nice meandering walk along roads back down the hill on its west side, going past the Governor's Mansion and then down side streets past many interesting old Victorian homes and summer cottages. 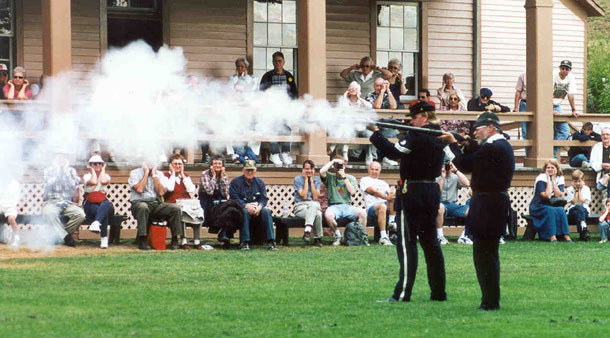 Fort "soldiers" in late 1800's uniforms firing their .45-70 Springfield rifles. After walking back through town towards the Harbour View Inn, we bought lunch at a popular streetside barbecue grill just next door to the Inn and took our food up to the balcony porch for a relaxed meal. That afternoon, we walked back over to Rob Jerstrom's studio to buy some of his Island photos to take home as mementos. We then walked along some of the scenic routes we'd traveled by carriage on our wedding day, so as to rediscover some of the many special photo locations we'd seen that day. 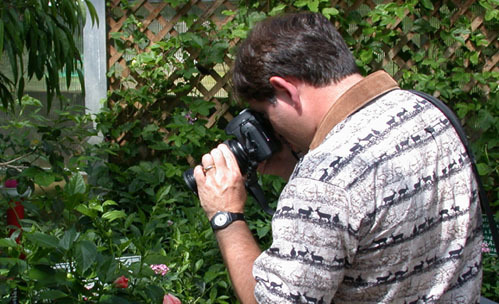 We'd visited the new Wings of Mackinac ButterflyConservatory on Tuesday during our wedding day carriage ride, and today we enjoyed a visit to the older Butterfly House located nearby the Harbour View Inn, where Charlie took photos of many pretty butterflies. 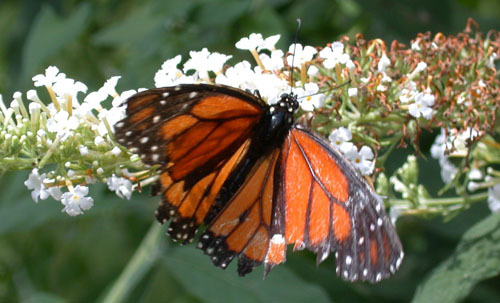 Butterflies are of special interest in a place so full of flowers as is the Island. Early that evening we dressed up a little and strolled east over to the Mission Point Resort. 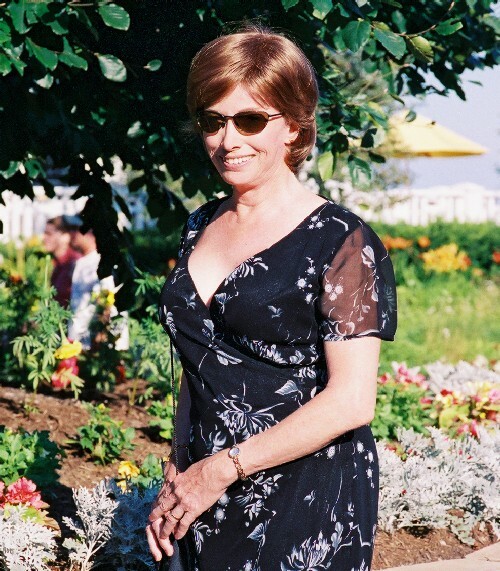 The Resort has many spectacular flower gardens on its extensive grounds and is a wonderful place to explore and take photos. 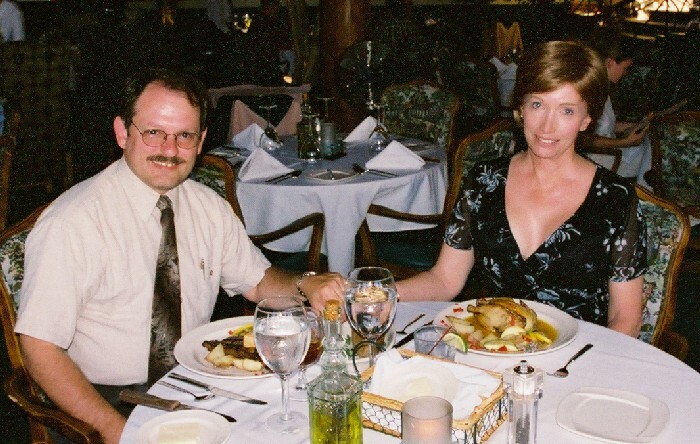 On this, our last evening on the Island, we had dinner at the Mission Point Resort's main dining room - it was a truly fine meal - one of the best of all we had on the Island. After dinner we walked back to the Harbour View, and relaxed on the upper balcony deck, watching it get dark and all the harbor lights come on. We began feeling romantic again, and retired early to enjoy each other's intimate company again.